When this movie came out a few years ago, I missed watching it because it seemed like just another generic action-spy film. Sure, the main character might be smart, leading to his professional “skills” (in more than one realm), but the trailers never really hinted at the reason for this attention to detail. 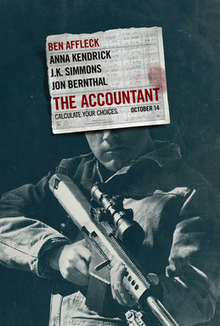 Having now seen it, The Accountant takes an interesting approach to the action-spy genre while also including a number of twists that were as satisfying to figure out ahead of time as they were to see revealed on the screen. I will say that the plot of The Accountant was sometimes confusing, but only because I felt like they glossed over some plot holes and leaps in logic. Even if I was asking myself, “Hey, what about . . . ?” I didn’t have much time to dwell on it. The somewhat frenetic pacing of the movie helped to push the plot forward to some well-done revelations that had just enough foreshadowing to be fulfilling. I also wasn’t completely sold that the Treasury Department was functioning more like the CIA in regards to this federal manhunt. Either way, the strength of the rest of the film helped to gloss over these rough bits. The highlight of The Accountant, I think, is the main character, portrayed by Ben Affleck. In a world that’s trending ever forward toward full inclusion, this character’s particular condition could undoubtedly lend itself to the attentiveness needed for accounting, as well as fast-paced action sequences. I do worry that the representation of this condition might be more along the lines of the stereotypes usually associated with it, but I think it also shows that such a condition can be lived with and used as an advantage. At the very least, it lent itself to a few hilarious moments as the main character didn’t necessarily know how to deal with the people around him. A satisfying twist to the action-spy genre, I give The Accountant 4.5 stars out of 5.